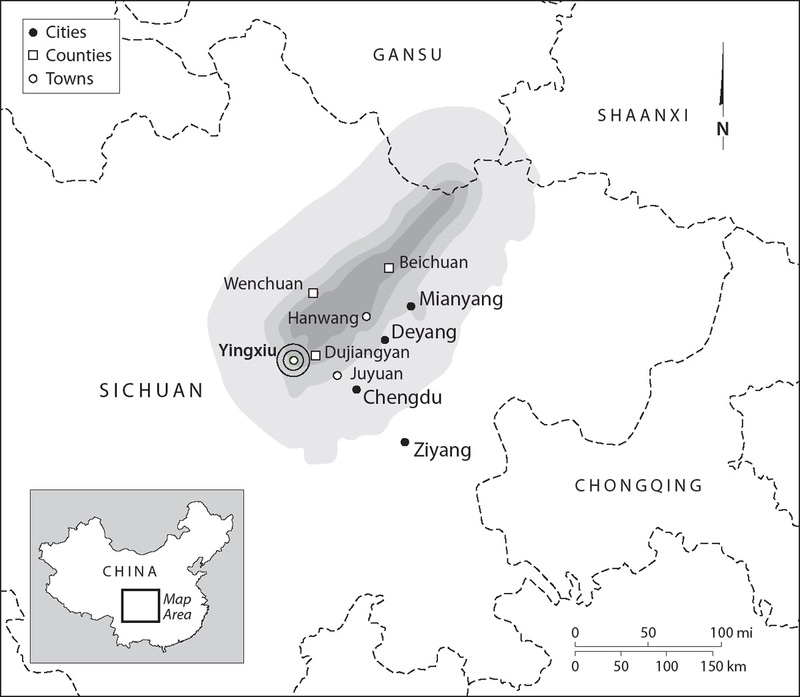 On May 12, 2008, an earthquake measuring 7.9 on the Richter scale struck Sichuan, a densely populated province in western China.1 The earthquake resulted from the long-term movement of the Longmenshan Fault, a “convergence of crustal material slowly moving from the high Tibetan Plateau to the west, against strong crust underlying the Sichuan Basin” (United States Geological Survey 2016b). This movement is occurring at a glacial pace, but its path has led to catastrophic quakes and landslides for millions of years. The Sichuan earthquake was one of the deadliest episodes in this process. According to the State Council Information Office, the earthquake killed 87,150 people, 17,923 of whom are still missing and are presumed dead (State Council Information Office 2008b). It impacted more than 45.5 million people in Sichuan and adjacent provinces. About 15 million people were evacuated, and about 5 million were left homeless. An estimated 5.36 million buildings collapsed, and more than 21 million buildings were damaged to varying degrees (Renminwang [People.cn] 2008). The total economic loss was estimated at 845.1 billion yuan (138 billion US dollars) (State Council Information Office 2008a). The 2008 Sichuan Earthquake. United States Geological Survey. The USGS (United States Geological Survey) ranks the Sichuan earthquake as the seventh deadliest quake in the world and third in China in the period of 1900–2014 (United States Geological Survey 2016a). It is the third deadliest disaster of any kind in the history of the People’s Republic of China, following the Great Leap Forward famine in the late 1950s and early 1960s, which killed millions, and the Tangshan earthquake in 1976, which killed about 240,000. The Great Famine lasted several years, whereas the Sichuan earthquake accomplished its deadly job in mere minutes. The Tangshan earthquake hit an industrial city and its suburbs; the Sichuan earthquake, in contrast, devastated a mostly rural region, triggering explosive geological reactions not just at the epicenter, but also in other places along the Longmenshan Fault—Dujiangyan, Beichuan, Mianzhu, Qingchuan, and as far as in the neighboring province of Shaanxi. Very few disasters had wreaked havoc over such a large area and affected so many people in just an instant. Even these striking comparisons cannot adequately reflect the shock and tragedy on the ground. At Juyuan Middle School in Dujiangyan, a building collapsed immediately after the quake, burying several hundred students and teachers. Parents, local government officials, and the Armed Police rushed to the site, trying to rescue them with their bare hands and simple tools, but only twenty students were dug out alive in the first couple of hours. Others were trapped under the rubble, crying for help. Cranes and machinery finally arrived at dusk, as heavy rain poured down on the desperate parents. When a student was pulled from the rubble and carried out on a stretcher, desperate parents dashed toward the body to see if it was their child, usually finding that the student was already dead. The child’s parents wailed uncontrollably and fell to the ground, while others staggered back and continued to wait helplessly. The school set up a tarp-covered shelter for the parents to light incense and firecrackers, in accordance with the local mourning custom. So many students were found dead that, according to a journalist from the Financial Times, the firecrackers were heard “at regular intervals of about 5, 10 minutes” (Cable News Network 2008). Then, the parents rode away on motorcycles, carrying their children’s bodies on their backs, and embarked on a hard trip back home. Juyuan was only one of the many schools that toppled in the earthquake. As a report in Caijing, a popular magazine, in June 2008 noted, an official from the Ministry of Housing and Construction estimated that 6,898 school buildings had collapsed as of May 16, 2008. This number did not include those in Beichuan and Wenchuan, two devastated counties. Regarding scale, the town of Juyuan was not even the most devastated place, since most of its buildings remained intact or were only slightly damaged. By comparison, many other towns and villages in Sichuan were destroyed or simply swallowed by landslides. The county seat of Beichuan, for example, located in a narrow valley, was utterly devastated by boulders and landslides from the surrounding mountains. Decades earlier, when the county government decided on the current location as the county seat, the residents worried about the potential “dumpling effect”: that landslides from the mountains could easily enclose the town, just as dumpling dough wraps stuffing. This worry turned into reality decades later at the moment of the earthquake. The ground rocked like a boat on a storm-tossed sea, back and forth, up and down. The sky suddenly became dark amid a powerful dust storm, and people closed their eyes and coughed violently. When the storm subsided after two minutes, students and teachers at Qushan Elementary School found that a small hill of earth had appeared on the playground, while buildings in the school were hit by boulders and had toppled into pieces. Not a single building in the town stood intact. People were buried and crushed by falling walls and rubble. Not far from the county seat, at Beichuan High School, students taking a physical education class were on the playground when the quake hit. Suddenly they heard a huge roar and saw a wide crack appear in the ground. All of them were pushed down to the ground as if by a giant hand. They were the lucky ones. The students in the main building were buried under the rubble. Only a few had been able to get out of the building; as they dashed down, the stairs behind them broke into pieces, one after another. The casualties of Beichuan School astonished everyone. More than a thousand students and teachers died––roughly 30 to 50 percent of the total school population.4 One of the classes had to be merged with others because so few students survived (Feng 2010, 20–24). FIGURE 1. Earthquake survivors walk among the rubble in Beichuan. May 16, 2008. Reuters/Bobby Yip. The earthquake was not just a local disaster. Nearly half of the country felt its tremors. In Chengdu, the metropolis nearest the affected areas, many residents felt buildings shaking violently, and some reportedly saw frightening waves lift and throw down the roads. Some heard a noise like the rumble of an invisible subway train underneath the city. Those in high-rise buildings immediately ran down into the streets. In an interviewee’s words, “people looked at each other with a confused expression; my mind went blank; everyone was trying to find out what happened, but no one knew what to do next.”5 City roads and highways were jammed because drivers had abandoned their cars and run away in fear.6 After the first several hours of chaos, they found that Chengdu had survived mostly intact, but the daily routine in the city had been disrupted. Even in cities as far afield as Shanghai, Beijing, and Guangzhou, more than a thousand miles away from Sichuan, residents also felt the tremors. FIGURE 2. 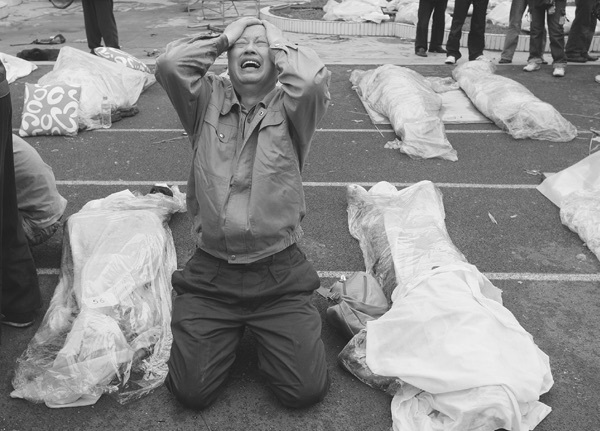 A father cries next to the body of his son in Hanwang, Mianzhu. May 14, 2008. Reuters/Jason Lee. In China’s cultural geography and in popular perception, Sichuan is famous for breathtaking mountain scenery and rugged roads. Li Bai, one of the greatest poets in China’s history, expressed his admiration for the scenery and his frustration with the roads in his well-known poem “Hard Is the Road to Shu”: “Oh, but it is high and dangerous! Traveling on Shu’s roads is even more difficult than scaling into the sky!”7 In some points in history, the mountainous roads protected Sichuan from invasion and contributed to its prosperity, even when the rest of China suffered from famines and wars. To distant observers following the news, the Sichuan earthquake consisted of a series of melodramatic episodes––trapped children and adults were rescued from the rubble, usually followed by cheers celebrating the miracle. But things were not so sensational on the ground. Rescuing a single person took hours, even days. Responders, working in shifts, slept for only a couple of hours every day, usually on the bare ground. The onsite crowd had to be absolutely quiet because the responders needed to listen for any voices rising up from below. Doctors and nurses had to be always prepared to attend to the trapped survivors at a moment’s notice. Sometimes they had to perform amputations on the survivors, right on the rubble, to save their lives. On top of all this was the daunting task of sheltering the fifteen million survivors and evacuees. The local governments used sports stadiums and university campuses as evacuation shelters in major cities like Chengdu and Mianyang, but most survivors had to stay in tents and self-made tarp shelters. Food and water had to be provided, and sanitization had to be taken care of in places with heavy casualties. Hospitals in Sichuan were filled to capacity with the injured and could not take any more; some patients had to be transferred to outside provinces. The Sichuan earthquake happened in an extraordinary year, 2008, three months before the Beijing Olympics and two months after a series of uprisings in Tibetan areas. China was in the spotlight. International public opinion condemned the government for cracking down on the Tibetan protesters and blocking the foreign media’s entry into Tibet. Human rights organizations called for a boycott of the Olympics, and pro-Tibet protesters clashed with Chinese students in overseas cities through which the Olympic torch relay passed. Domestically, the public criticized the government for its inadequate response to a historic snowstorm in January and February. Separatist ethnic groups in Xinjiang were seeking opportunities to stage protests and riots during the Beijing Olympics. The earthquake occurred at a difficult time, posing enormous challenges to the Chinese government and society. The tragedy, chaos, and difficulties, however, led to many extraordinary happenings, which made the earthquake not only a devastating disaster but also a political drama. One of the most important episodes of the drama was that countless Chinese citizens engaged in public activities to help the survivors, rebuild the communities, commemorate the victims, and demand justice. Social scientists term participation in these kinds of activities “civic engagement” or “civic participation” or “civic action,” in which “participants are coordinating action to improve some aspect of common life in society, as they imagine society” (Lichterman and Eliasoph 2014, 809). No keen observer could miss an extraordinary phenomenon in the wake of the earthquake: a massive number of volunteers either went to Sichuan to help with the relief effort or provided services and collected donations in other places. Nobody knew for sure how many people were involved in this wave of volunteering. Estimates ranged from 200,000, the number of volunteers registered with the Red Cross and the Youth League (which was believed to be significantly lower than the actual number), to 10 million. They rushed to the quake zone, by car, train, or plane from adjacent cities such as Chengdu and Mianyang, and from as far away as Shanghai, Beijing, and Guangzhou. They did whatever work they could do and were assigned to do: cooking meals, taking care of children, unloading supplies from trucks, and cleaning toilets in densely populated public shelters. Chinese citizens did more than volunteering. A few days after the earthquake, some influential public intellectuals, the liberal media, and netizens advocated a national mourning observance for the earthquake victims. The state eventually accepted the proposal and, for the first time in Chinese history, held a period of national mourning for ordinary people instead of leaders, heroes, soldiers, and officials. On May 19, at 2:28 p.m.––the exact time the earthquake struck seven days earlier––with the national flag throughout the country flying at half-staff, air-raid sirens blared and a three-minute silence was observed. People crowded squares in major cities to commemorate their fellow citizens, and public intellectuals and media celebrated their successful public advocacy. Some citizens went even further. They were not content with simply alleviating their fellow citizens’ suffering; they wanted to address the causes of the suffering. A vexing issue emerged immediately after the earthquake: a massive number of schools collapsed and killed at least 5,335 students, according to official statistics, whereas some nearby buildings survived. People began to ask: Why did so many schools collapse? Who should be blamed for the children’s deaths and the parents’ suffering? Parents of the student victims and many observers believed that contractors, local officials, and even the whole education system should be held responsible for the tragedy. They speculated that because of the low budgets allocated to school construction and possible corruption involved in the bidding process, contractors had used substandard materials—unreinforced concrete, or sand mixed with concrete, or no concrete at all—to increase their profits. Some parents began to protest about a week after the earthquake. The government conducted some investigations but finally declared (without releasing a formal report) that buildings failed because of the intensity of the earthquake rather than poor construction. Outraged by the state’s denial, artist Ai Weiwei and activist Tan Zuoren mobilized volunteers to collect the student victims’ names as a way to enhance the public awareness of the issue and resist the oblivion the state imposed on the public. Volunteers phoned various government bureaus to request the release of the students’ information, and, after being denied, they went to the quake zone and visited almost all the schools—town by town, door to door—to verify students’ names and other information. Liberal intellectuals and political dissidents made underground documentaries, built alternative memorials, and created artistic works to commemorate the students and to challenge the state’s moral authority. The Sichuan earthquake, therefore, was a social-political drama that played out and made visible the ubiquitous but otherwise little discernible self-organized civic engagement in Chinese society. Public discourses paid much attention to this massive wave of civic engagement but disagreed on how to understand and explain this extraordinary collective act of compassion. Some explained it as an automatic outburst of sympathy, which was overshadowed by day-to-day life but activated by the catastrophe. In other words, “disaster brings out the best in people.” This conventional wisdom corroborated philosophers’ assertions about human beings’ moral nature. The ancient Chinese philosopher Mencius believed that everyone has an instinctive compassion for other people’s suffering (ceyin zhixin). Similarly, in his 1759 classic, The Theory of Moral Sentiments, Adam Smith described how a European man would respond to an imaginary earthquake that “swallowed up the great empire of China,” a country then remote and mysterious to Europe. Smith emphasized, “human nature startles with horror at the thought” of not caring about the tragedy, and often “we dare not, as self-love might suggest to us, prefer the interest of one to that of many” (Smith  2009, 159). In many disasters, care for other people’s suffering motivates civic engagement, including rescue, relief, recovery, public debates, rituals, activism, and commemorations (Fortun 2001; Dynes and Tierney 1994; Eyre 2007). In massive disasters in different historical periods in China, especially in the late Qing and the Republican era, various civic associations—religious, commercial, international, local—actively participated in disaster relief and fundraising for victims of droughts and floods (Cai 2005; Li and Xia 2007). This view, however, needs qualification. Compassion for other people’s suffering is universal, but it needs social conditions to turn into public expressions and actions. Mencius reminded us that compassion in traditional Chinese society aimed to maintain the familial social structure: that we always have greater concern for those socially close to us—family members, relatives, the chief of the village, and so on—than strangers. The “solidarity among strangers” in the wake of the Sichuan earthquake went well beyond the familial framework in the traditional Chinese moral imagination. The charity events in traditional society also relied on various associations—chambers of commerce and religious associations—which had already carved out a social sphere outside the familial structure in the late Qing and Republican era. In modern Western societies, compassion and volunteering for distressed and devastated strangers—the “distant suffering” or the spirit of “good Samaritans”—do not exist in a social vacuum either (Wilson 2000). Ubiquitous post-disaster volunteering never happens automatically but requires certain social and political conditions to become a reality. In Japan, for example, a country with a longer history of civil society than China, large-scale post-disaster volunteering did not emerge until the 1995 Kobe earthquake (Shaw and Goda 2004; Tierney and Goltz 1998). As studies of contentious politics show, disaster-related activism as a form of civic engagement requires particular social and political conditions to emerge, continue, and succeed (Fortun 2001). 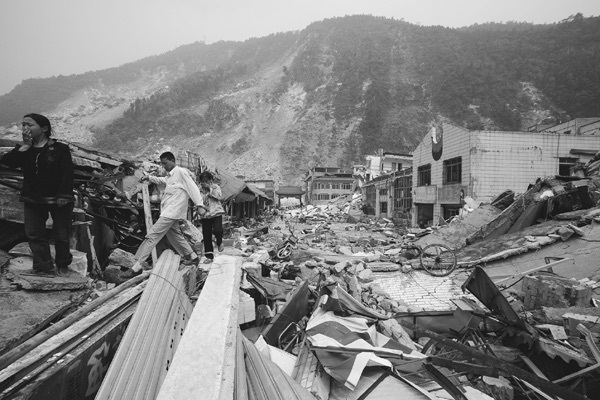 The civic engagement after the Sichuan earthquake was not an exception; it was not only a “natural outpouring” of sympathy but also a complex political and social process. Another view in the popular discourses regarded the volunteering as a large-scale activity organized and mobilized by the Chinese state, which intended to use national solidarity to shore up its legitimacy. An obvious problem with this view is that it takes a narrow view of “civic engagement,” limited to volunteering in disaster relief and recovery but excluding activism and other contentious forms of civic participation not organized by the state (Eliasoph 2013). Even within the limits of its narrow definition of volunteering, this state-mobilization view does not grasp something new and important: most volunteers after the Sichuan earthquake were not organized by the state or by state organizations like the Red Cross.9 Rather, they were mobilized by various civic associations, such as nongovernmental organizations (NGOs), grassroots associations, and small groups. This phenomenon might be taken for granted elsewhere but was significant against its historical background. During the Mao years, after massive disasters, many danwei (work units) organized response teams to rush to disaster zones to provide assistance, required their workers to work for extra hours to produce supplies, and deducted donations from their employees’ wages (Qian 2008b). Similar state-organized civic engagement existed after the Sichuan earthquake. For example, some local danwei in the affected zone set up response teams; state-owned hospitals outside the quake zone sent doctors and nurses to Sichuan; the Red Cross remained a major organizer of volunteering. Nevertheless, many more volunteers went by themselves, with only brief encounters with state organizations, such as registering with the Red Cross, cooperating with the Youth League, and so on. This wave of self-organized, grassroots civic engagement in disaster relief and recovery was indeed unprecedented in the history of the People’s Republic of China. From a longer historical perspective, it also differed from the elite- and foreigner-dominated charity activities in the late Qing and the Republican era. It was those self-organized, grassroots actions instead of the state-organized relief, which predictably occurs after every major disaster, that surprised and delighted many observers. This patriotic fervor among volunteers was not new in China or other contexts. Many idealistic American volunteers who joined the Peace Corps were inspired by John F. Kennedy’s words “ask not what your country can do for you—ask what you can do for your country.” This view made even more sense in the year of 2008. While the Chinese state suffered from an international public relations crisis due to the Tibetan uprising and boycotts of the Beijing Olympics, many Chinese regarded the criticisms of the state as malicious attacks on the Chinese nation. Therefore, the impressive wave of volunteering could have been an outburst of bruised national pride, a symbolic gesture to show the world the sympathetic side of the Chinese. Nevertheless, as this book will show, nationalism was only one of the cultural terms that people used to understand and interpret their actions. Many citizens understood their actions by resorting to other cultural ideas, such as individualism, religion, and political ideas about civil society and democracy. This diversity became salient only when one listened closely to what they said and observed closely what they did, whereas a brief media interview could lead to little in-depth knowledge because a person could put on a patriotic face in front of foreign journalists. A more sophisticated view regarded the post-earthquake engagement as an indication that civil society had started becoming an independent and important force in China. In an enthusiastic editorial a week after the earthquake, Asia Weekly applauded the volunteers for their “quality and awareness of citizenship,” which it considered as “the sprout for a Chinese civil society in the future” (Li et al. 2008). In this discourse, the volunteers had a clearly defined idea of “civil society” or “citizenship,” which motivated and guided them to engage in public-spirited activities and build a “civil society.” The year of 2008 was claimed to be the “birth year” of civil society in China. People who made this claim certainly knew its historical inaccuracy, because Chinese civil society was born long before 2008, but their statement was intended to celebrate a potentially significant turning point: Chinese civil society would gain more autonomous social space, and the post-earthquake participation, as a “culture of democracy,” could empower citizens to pursue a democratic civil society. This discourse prevailed in the media in the mainland and Hong Kong as well as in academia, triggering an upsurge of hope for the future of civil society. This view rightly identified the “unprecedentedness” of the civic engagement—grassroots participation through civic associations instead of the state system—and situated it in the historical development of Chinese civil society in the post-Mao years. Much evidence presented in this book supports this claim. Nevertheless, its optimism underestimated the complexity of political factors involved in the emergence, development, and consequences of civic participation. For example, the development of Chinese civil society did not automatically lead to the emergence of the large-scale post-earthquake engagement because this development was often hindered, exploited, and manipulated by the authoritarian state. The state learned a lesson from the East European experience in the 1980s and the color revolutions in the 2000s—in which “civil society” was a rallying cry of autonomous associations and social movement organizations in their march toward democracy (Ekiert and Kubik 1999)—and thus imposed many restrictions on nongovernmental organizations. The number of people also mattered. A big crowd engaged in collective action, regardless of its aims, constitutes in and of itself a political issue. Even if a collective action is tolerated or even initiated by the state, a large number of participants may lead to unintended consequences, turning an officially sanctioned gathering into an antigovernment protest (Pfaff and Yang 2001). The sheer number of volunteers in Sichuan—millions!—and many not organized by the state made the civic engagement in the rescue and recovery the largest collective action since the Tiananmen incident in 1989. The seemingly nonpolitical volunteering turned very political at that moment. Moreover, with the wisdom of hindsight, it is clear that the enthusiastic optimism about the future of civil society was wishful thinking. As I will show in the chapters that follow, the post-earthquake engagement failed to bring significant change to Chinese civil society. In sum, all these restrictive conditions added complexity to the simplistic view of Chinese civil society and begged a more sophisticated explanation. At a deeper level, the participating citizens did not always understand and interpret the meanings and goals of their participation in the same way as this civil society view would have anticipated. By definition, civic engagement aims to improve some aspects of society, and its style and effects largely depend on the participants’ understanding of some key issues: What “society” do they want to improve? What is the common good? How should society be improved? (Lichterman and Eliasoph 2014). The classical ideals of “civil society” as a “good society” include several key ideas: independence from the state, tolerance of diversity, equality of opportunities, freedom from tyranny, and so on (Brunkhorst 2005; Taylor 1995; Calhoun 2002; Putnam, Leonardi, and Nanetti 1993, 87–90). Liberal media commentators and dissident intellectuals adhered to these ideas, but public-spirited citizens on the ground did not always understand their actions in this way. Thus, it would be a mistake to substitute reality for liberal interpretations of reality. Moreover, if we listen to how they talked about the meaning of their actions more closely, we may hear about their painful experiences and the dilemma of how to come to terms with human suffering. Many of these uneasy discussions were about the school collapse issue. On the one hand, the participating citizens tried to reduce people’s suffering and help restore them to a normal life by building community centers, teaching summer courses for children, and collecting donations for educational assistance. On the other hand, it was not uncommon for a volunteer to teach in a tent school by the ruins of the old school, which had collapsed almost immediately after the quake and killed hundreds of students. The problem was too obvious to ignore, but would the volunteers have serious public discussions about it? And did they decide to take action to remedy it? To take such a step made people nervous, owing to the likely outcome of political suppression, which might jeopardize their personal lives and careers. But not to take this step was equally difficult––consciously or unconsciously, one might feel guilty for not doing something for the poor child victims under the rubble. This dilemma is ubiquitous in various contexts; it comes from the tension between two kinds of civic engagement: “harmless and warm” volunteering that is comparable to sticking a Band-Aid on a wound, versus “angry” activism––Jane Addams–style actions that address the causes of social illness (Eliasoph 2013). The earthquake made manifest this dilemma by placing compassion side by side with unsolved problems: volunteers were reading stories to children not in local libraries but by the collapsed schools that had killed other children. This dilemma fell beyond the scope of the optimistic and normative view of civil society. In sum, all these popular discourses correctly pointed out one or two dimensions of the civic engagement in the aftermath of the Sichuan earthquake, but they left us with more confusion than a clear, comprehensive story of this extraordinary event. The impressive civic engagement after the Sichuan earthquake consisted of a series of public actions embedded in its social and political context. This was something to be explained rather than taken for granted. Research has shown that civic engagement is shaped by group dynamics (Lichterman 2006), macro-level cultural ideas (Wuthnow 1998, 1991), the Internet (Xenos and Moy 2007), social capital (Putnam 2000), participants’ demographic characteristics (Beyerlein and Sikkink 2008; Wilson 2000), and political contexts (Schofer and Fourcade-Gourinchas 2001; Skocpol and Fiorina 1999). The last factor is particularly important. Authoritarianism is not an exception to but a variation of political context. As civic engagement is widely seen as a part of a “culture of democracy,” the ways citizens participate in civic engagement in an undemocratic context, in which they have to overcome more institutional and cultural constraints, is worth exploring. In this book, I aim to provide a snapshot of civic engagement in contemporary China by examining the unprecedented, memorable civic engagement in the aftermath of the Sichuan earthquake. I focus on the grassroots civic engagement organized by civic associations. This is not meant to dismiss the importance of state-organized volunteering, which certainly existed and remained strong in the aftermath of the earthquake; its features and outcomes, however, were widely known and fairly predictable. Nor does this focus mean that the grassroots civic engagement could be free from the state’s system. Instead, as my analysis shows, it was deeply embedded in and intertwined with the political system and its affiliated organizations. The aim of the book, in fact, is to reveal the complexity of the grassroots engagement and its political context. I ask several questions: Why was there such large-scale grassroots civic engagement after the Sichuan earthquake but not in previous disasters? How did different types of citizens engage? How did they interact with different levels and sectors of the Chinese state? Against the backdrop of human suffering after the earthquake, how did the civically engaged citizens understand and interpret the meaning of their actions, deal with the moral-political dilemmas they encountered, and take––or not take––actions to address the suffering they witnessed? All these questions boil down to three components of civic engagement: contexts, actions, and meanings. By attempting to answer these questions, my ultimate goal is to understand what I term the “politics of compassion”: how political conditions shape expressions of moral sentiments through civic engagement. 1. The 2008 Sichuan earthquake is sometimes referred to, particularly in the Chinese government’s documents and narratives, as the Wenchuan earthquake (Wenchuan dizhen) or the Great Wenchuan earthquake (Wenchuan da dizhen), named after the county at its epicenter. This name, however, often causes unnecessary confusion and misunderstanding among people unfamiliar with the earthquake. For example, some believe only Wenchuan was affected. In fact, the earthquake devastated many places outside Wenchuan, such as Beichuan, Dujiangyan, and Qingchuan. I refer to this disaster as the “Sichuan earthquake” to do justice to all the seriously affected places. 2. Pseudonyms are used for interviewees and the organizations they belonged to, unless they are widely reported public figures, such as Tan Zuoren. All interviews were conducted by me. 3. Interview with Zihou, June 14, 2009, Chengdu. 4. As I will show later in this book, an accurate number of casualties at Beichuan High is still unavailable because of political restrictions on investigations. We can estimate the percentage by examining some reports with information about the school’s casualties, which were published before the reporting ban (Cong, Liu, and Wang 2008). 5. Interview with Zhou Yin, August 1, 2009, Chengdu. 6. Interview with Wu Hang, June 15, 2009, Chengdu. 7. Shu is the ancient name for an area that today is part of Sichuan Province. 8. Interview with Liang, July 7, 2009, Chengdu. 9. Unlike in other countries, in China the Red Cross is administered by the government, particularly the Ministry of Civil Affairs.